I lean against a low wall. I’m wearing a soft coat. The book is Fox by Dubravka Ugrešić. There are no birds, no bird sounds. “How do stories come to be written?” it asks. Ugresic tells of a story written by Russian writer Boris Pilnyak. It’s called A Story About How Stories Come to Be Written. It begins with a woman named Sophia. Sophia marries a Japanese Officer named Tagaki. Takagi is discharged from the army for marrying a foreigner. The couple, banished, begin a passionate newlywed life. I read the details of their passionate newlywed life. The sun will set at 7:11pm. I’m on a roof to catch a glimpse of an aurora. An astronomy site says to look east at sunset. Another says to look west before midnight. They all say it’s best to be somewhere high up. They all say it’s best if there are no clouds. They all say say maybe it won’t happen at all. I turn to the next page of Fox. “So really, how do stories come to be written?” Ugrešić asks again. She returns to the newlyweds in Pilnyak’s story. For months, the husband, Tagaki, disappears for a couple hours every day into his study. Sophia gives him privacy during these retreats. She thinks he is reading. She thinks he needs quiet time. Later, it turns out, her husband has written a novel. The novel is about Sophia. Sophia realizes her husband has been watching and documenting her every move. She feels betrayed, deceived. Spied on. The novel brings Tagaki fame and prestige. Pilnyak, at the end of this story, claims that writers are best represented by foxes. They watch, they lie in wait. They are masters of illusion. Something on the roof begins to rattle. I recall that foxes have excellent hearing. They can hear rodents digging underground. If I were a fox, I would know where the rattling sound was coming from. My gaze lands on a rusty exhaust pipe protruding from a neighboring roof. I decide it is the source of the sound. I look beyond the exhaust pipe. In a building across the street, a man in a blue t-shirt stands in a kitchen. The man is eating what looks like a bowl of spaghetti. 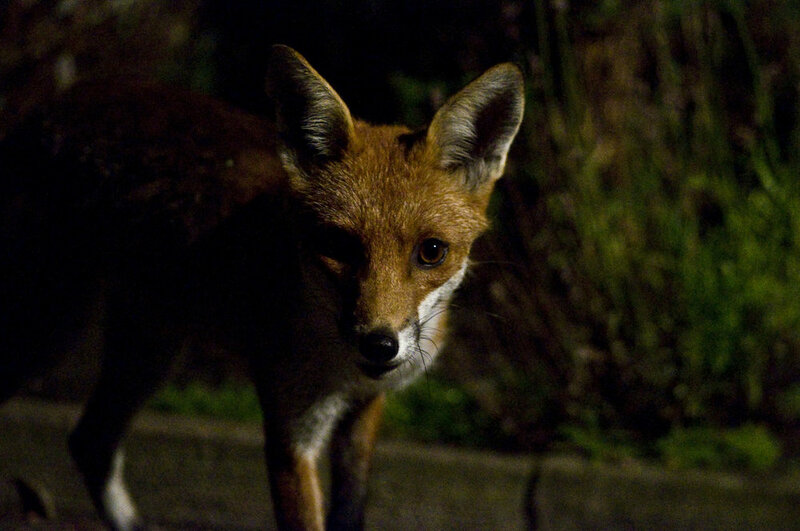 I recall that foxes have light-sensitive cells in their eyes that enable them to see at night. If I were a fox, I would know for certain if the man was eating spaghetti. The man stares out of his window straight at me. If I were a fox I would know if he sees me. In a window to the left of the man, a woman paces around a large black table. She gestures with her arms though the person on the other line cannot see her. I look back at the man. The man may know I’m looking at him. The man may be looking at me. The woman does not know I am looking at her. The woman is not looking at me. Neither of them know I’m writing about them. “Putting one’s life and the lives of others on display is, at this moment, no longer a question of ethics and choice, but one of automatism: everyone does it, and everyone expects it of everyone else,” Ugrešić writes. She muses that if Sophia were alive today, perhaps she would have been less shocked and hurt by her husband’s exposure of her private life in literary form. Perhaps Sophia would be rushing to write her own account, Ugrešić proposes. It’s true: we see and share so much more than we used to. Of the world, of one another. Astronomers know that the aurora may occur in New York tonight because they witnessed the solar flare with their precise visual equipment. “A chunk of the sun’s atmosphere blasted off and began hurtling toward Earth this week. It is expected to hit the planet’s magnetic field on Saturday, which would produce the colorful glow of aurora borealis.” The New York Times writes. A chunk of the sun. Causing its magnetic field to shift. Foxes can always sense the Earth’s magnetic field. It appears as a “ring of shadow” on their eyes. The ring gets darker the closer a fox turns towards magnetic north. Foxes use this ring to hunt their prey. I turn back to Fox. Ugrešić describes looking through her old unfinished master’s thesis about Boris Pilnyak. “Many stories in the life of a writer end as lithopedions, as calcified embryos,” she states. I think about all these unfinished stories, stories that never lived, stories with no endings. I think about the visual spectacle I’m awaiting tonight that may or may not come to pass. “There are several reasons that Saturday’s possibility of seeing the northern lights might be, as Mr. Onsager put it, a ‘dud.’” The New York Times warns. Set expectations with your kids, one astronomer says. A fifty-fifty chance, says another. I glance at the sky again. A single plane flies low across the deepening blue. Can its passengers see me? They’re all living their own stories tonight. I would be a footnote in their evening: a figure, far below, reclining on a rooftop. “We are all footnotes, many of us will never have the chance to be read, all of us in an unrelenting and desperate struggle for our lives, for the life of a footnote, to remain on the surface before, in spite of our efforts, we are submerged,” Ugrešić claims, in a morbid moment. I recall a recent news story in which a fox is found dead in a chicken coop in France. The chickens ganged up on the predator, pecking it until it was no longer a threat. Soon a few stars have appeared in the sky. The man in the kitchen now stands at his sink. The woman next door ruffles through some papers. Then she is in the kitchen. I realize, with shock, that the rooms are connected. I’m surprised by this alteration in my story of them. The man in the kitchen and the woman at the table are not alone in separate apartments. She drapes her arms around him as he scrubs his bowl. She leans into his neck, kisses his ear. Heat rises in my cheeks as I observe this intimate moment. I switch on my phone flashlight and turn back to Fox. Ugresic asks how a story about how stories come to be written might end. She puts forth various endings, each with its own conclusion. In the last of them, she tells an anecdote about being on a train approaching Tokyo. The train bolts through a line of glass-fronted skyscrapers. Ugrešić reminds us that foxes are the masters of such illusions. She imagines that foxes are creating the visual spectacle unfolding in front of her. I imagine a fox plotting the visual spectacle I await tonight. I’ve finished its first section. How will its story continue? The man and woman sit on a couch now, her head on his shoulder. How will their story continue? There is a sudden scent of waffles on the breeze. The northern lights may be somewhere but they’re not here. I pick up my book and cross the roof. I retreat down a cold metal ladder towards my own lit window. The sky watches me descend, a curled fox in wait. Siena Oristaglio (all pronouns) is an artist and educator. She co-runs The Void Academy, an organization that helps independent artists thrive. She lives in New York City.